Although it is possible to use SSH/SFTP/SCP to collect log files with QRadar, that option may not be the most appropriated for every company. Those collection methods, called pull-collection, requires an extra account in the system (so QRadar can login to collect the log). Moreover, the pull-collection methods collect the logs in an interval (usually, 5 minutes), meaning that logs may take up to 5 minutes to arrive in QRadar. One alternative for collecting logs stored in files is using the rsyslog service, which is already pre-installed in the majority of the RedHat and CentOS versions. Those services are able to monitor a log file and forward each new log line to QRadar. If everything worked well, your service should be started without any errors. After that, restart rsyslog and check if the error persist. If it the issue is solved, then all you have to do is adding an exception to your SELinux to allow rsyslog to access the specific log file. This entry was posted in Administration, Integrations and tagged Collection, Log Sources, logs, rsyslog. The first line adds a “file monitoring” rule to the specific file. You can update the file monitoring frequency (in seconds) by changing the follow_freq parameter. The second line adds a syslog destination, if you already had syslog-ng configured for another log monitoring, this line may not be necessary. The third line adds a logging action from the source file to the destination syslog recipient. Done! You can now check on QRadar if logs are coming. This entry was posted in Administration, Integrations and tagged Collection, Log Sources, logs, syslog. One of the main questions when designing the architecture of a QRadar environment is using a centralized (with or without clustering) or a distributed deployment. It means, should we create a cluster of QRadar in a specific network or should we distribute our collectors across the networks? As usual, the answer is: Depends. The following pictures summarize the benefits and cons of the both cases. In the Centralized scenario, all the servers and collectors are in the same network. It makes the deployment and management way easier since we have just one point of maintenance and one point to “care about”, and it is very important especially when we have a geographically spread environment. But having all the SIEM solution in one network means that all the environment will need to connect to the cluster. In other words, the firewalls will allow traffic between the QRadar cluster and any server. Considering that some collection methods involves windows authentications, it means that if someone get access to the QRadar cluster network, the person will have access to any device on the network. Another bad point of this kind of deployment is the network failure tolerance. Lets say that the router in the border of the QRadar network goes down, all the log collection will be lost. The distributed collection usually takes more time (and money) to implement and requires more time/resources to maintain, since the appliances will be distributed physically and logically. But the advantages are clear. With a distributed deployment the main QRadar console will have access only to its’ collectors, and nothing more. It means that if someone get access to the main SIEM network, the person will be able only to send packets to very specific IPs (collectors), and since the QRadar collectors are completely hardened, the security risk involved on this deployment is very low. Another benefit of the distributed deployment is the network failure tolerance. Considering the same case of a broken router in the QRadar console network, in this case the collectors will not have connection with the main console and will buffer the logs. After the network connectivity being restored, the logs will be synchronized with the main console. As you guys noticed, the Distributed deployment can bring some good advantages compared with the Centralized one. But each company is a different case. Is up to you as an architect decide which deployment will fit your client need. Do you have any suggestion or comment? Drop us a line in the comments! This entry was posted in Administration, Sizing and tagged Architecture, Collection, Design, Sizing. Hi folks! I’m glad of receiving good feedback from you guys! 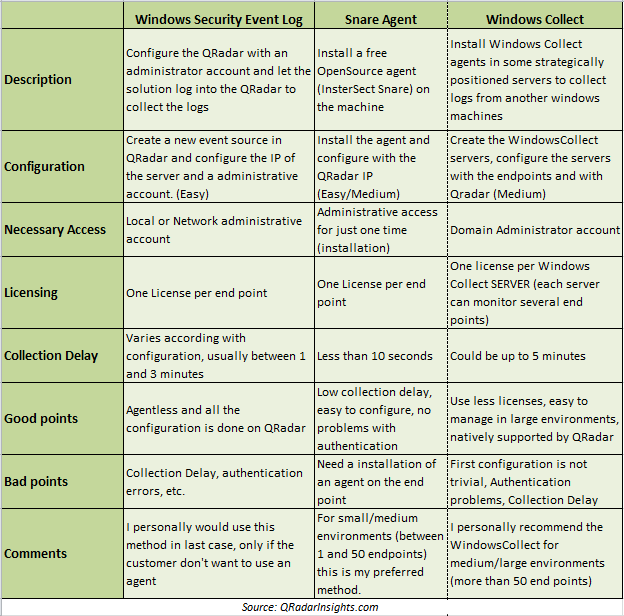 The topic of this post was one recent request from our followers, asking about what the best way to send windows logs to QRadar is. As you can imagine, there’s no best solution, it depends on what kind of environment we have. So to reply this question as simple and short as possible, I created the following table comparing some log collection methods. To get more information about the Snare Agent, you can check out the vendor website. To get more information about the another two collection methods, you can check out our post about configuring log sources and the official documentation in this another post. Do you have any question or suggestion? Let us know in the comments! This entry was posted in Administration, Integrations and tagged Collection, Log Sources, Snare, syslog, WinCollect, Windows Logs.